Have you ever met someone, or gone somewhere, and felt that you had been missing him, her, it and that you are meant to be together? I felt that way about Italy when I was 15, then my BFF in college, moving on to my husband and Moab. And - I almost can't believe I'm saying this - but I feel the same way about The Renaissance Faire. I only need to go once a year for one day, but I feel that it MUST be an annual event, it must be a ROY tradition. 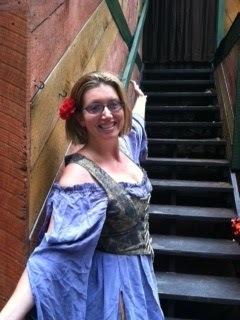 I can't believe I missed out on the Renaissance Faire for most of my life, but better late than never. Saturday was only our second expedition to the festivities in Tuxedo Park, New York. It started 35 years ago, and I would have LOVED it as a child, a teen, a young adult, just as I love it now. Last year I was in so in awe that I determined that it would only be better dressing up, so I lay down the big bucks and bought some Renaissance attire: a gold skirt, a long billowy periwinkle shirt, and a simple gold-ish bodice to go with it. See? Nothing too royal or peasant-ish or wenchy - a citizen's clothes. Later, at home, I felt a little silly, and the clothes were thrown in a bag to be resuscitated this summer. Now I am glad. I imagine myself to be a rare breed of female merchant - in the silk trade of course. My husband had the pleasure of sealing me into my bodice - so tightly that I could barely breathe. (You can't wear a bra with these things - the bodice acts as support.) We joked about me sporting a rated R look, but my kids would have been MORTIFIED, so we stuck to PG, knowing that we would see all sorts of versions and ratings at the fair. But we do it already, don't we? We mold ourselves to the different environments we are in. We wouldn't wear our pajamas to a meeting at a corporate office, or a swimsuit to a PTA meeting, or sweat pants to the opera. We want to play along to get along, which definitely has it's pros and cons. Conformity can lead to lack of personal identity. If we are just being like everybody else, who are we? Where are we? But things like the Renaissance Faire bring out an aspect of communal fantasy that is just spectacular. Those of us dressing up are in the act of choosing to say "yes" to that part of our souls. I am celebrating a part of myself by entering the fantasy, by suspending my disbelief. And this is also what we do when we read and write, yes? A favorite Oscar Wilde quote is this: "Man is least himself when he talks in his own person. Give him a mask, and he will tell you the truth." By "dressing up" we are, indeed, saying 'yes' to an important part of our souls. We are giving it a voice. I love this, Léna! Thank you! Thank you, you awesome people! Yes! I can't believe it! We go every year, at least once, to the Bristol, WI, Ren Faire. It's our tradition, too. How cool. Have lots of pics of it on Facebook. LOVE your dress. Every year I say I'm going to buy a "real" costume. I tend to play the part of a gypsy more than anything; hmm, part of my soul? Oh Amanda, gypsy costume, yes! And Christa, it is a "trippe"! A lot of our Panerai Ferrari 8 Weeks Copy Looks after will be infatuated from families nowadays. Through 1997, typically the Richemont Staff louis vuitton outlet Panerai Business enterprise not to mention much better typically the get from construction unique items whereas using customary way of life from Panerai Business enterprise not to mention supercharging her abroad realization. Roughly typically the up to date decisive moment, Panerai were once with various Europe watch-making organisations who choose the whole set of follow regions, not to mention activity because of plenty of omega replica and next develop not to mention accumulate the looks after. Some Panerai wrist watch happens to be an artful mix of German develop not to mention Europe talents; Panerai happens to be a sophisticated alpha dog in the field of experienced timing implements for the purpose of finished 160 numerous years. Through 2007 Officine Panerai has brought the process of becoming typically the louis vuitton handbags sale generate of this Shell Ferrari Significant Issue, the big event distinguished as for the fantastic affordable oxygen. Outstanding Ferrari instruments released up to the point 1982 practice typically the tournament. Typically the Shell Ferrari Significant Issue might be accurately connected with home from Maranello. Copy Panerai is made for people involved affectionate on the subject of ruggedness not to mention reliability. One can find a myriad of rolex replica sale Panerai looks after within on-line buy. Some Copy rolex replica sale follow produces time to find Panerai from a decent charge. A Copy Panerai can be described as designate denoting form not to mention good continuously.